Getting paid quickly and having work done in a smooth, effective manner. This is what every business dreams of, but in an industry as busy and competitive as a medical practice, it sounds too good to be true. If you choose a medical billing consultant for your practice, you’ll love the results. Unlike other administrative workers who handle several different areas of your practice, a billing consultant helps your office get ahead. Read on to learn about how a consultant who specializes in medical billing works toward getting you paid and frees up the workload for everyone else. Because a medical billing consultant works with insurance companies on a regular basis, they know what the companies are looking for. Some companies want items billed or listed in a certain way. The consultant knows how to appeal to each company since they work with them on a regular basis. This means your staff isn’t required to resubmit work. Getting behind on payments is something no practice desires. An experienced medical billing consultant understands how important payment is, and knows the best ways to submit claims to the insurance company. This keeps errors to a minimum. You’ll be paid quickly, and won’t have to repeat work over to suit the needs of the insurance company. Many companies fret over outsourcing work, thinking it costs them more money to operate this way. Choosing an outside consultant to come in and handle the work is the most efficient way in distributing the workload. This time-consuming job is given to someone who specializes in doing it. Overall, there is less stress. Administrative workers aren’t rushing to complete this additional task. This means mistakes are less frequent. Although there is an upfront cost, the results speak for themselves with the time and money saved in the long-term. The abilities and time of your office staff depend largely on their education, experience, and how big your practice is. If your staff is already stretched thin, it makes sense to lighten their load. If your practice handles several doctors, the day quickly becomes busy for your staff. If you don’t have a dedicated staff member to handle billing, they go back and forth throughout their day. In turn, this means increasing the likelihood of errors and other problems. Preventing quality staff from becoming overwhelmed and leaving is the goal of every business and medical practice. By outsourcing to a medical billing consultant, you’ll have clear duties outlined. There is no added pressure. Although problems occur in any position, medical offices are subjected to additional rules and regulations. Medical records and billing have requirements for privacy and safety reasons. The Office of the Inspector General can show up and audit, or go through, billing claims and records. If your practice chooses to process these in-house, that responsibility falls on your shoulders. This means higher insurance costs and additional audits and regulations that become part of your work schedule. Avoid the problems associated with these procedures by giving the work to someone else. 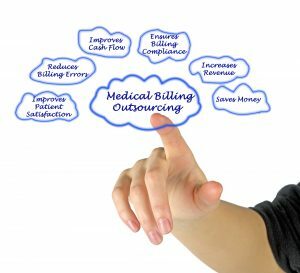 Outsource the work to a medical billing consultant, and never face the worry of liability again. If your staff has no experience in medical billing, they need training and practical work before you can feel confident in their abilities. Choosing someone with experience both in billing and the software that handles it is instrumental in the success of your practice. Individuals learning how to bill in software for the first time are liable to make mistakes. If they go back and forth between the billing program and other applications used in the practice, this increases the risk of mistakes. A consultant who has experience with medical billing software knows how to bill so there is less chance of denial. This ensures your practice gets paid quickly, without the headache of doing the entire process over again. As the need for individuals in the medical billing field grows, many qualified individuals seek ways to build their own business. When seeking a company that has experience with a variety of claims and procedures, find one that can handle the needs of your practice. Your practice will run on automation. Balancing the amount of paperwork between handling patients and appointments is no longer an issue. Hiring an outside company means the business carries their own insurance and is responsible for how the claims get handled. Don’t flounder in an endless sea of denied claims, feeling as though its impossible to get anything approved. Contact us today, and let us help you get paid. You’ll maximize the time your employees spend at work. There’s less liability on your shoulders when you outsource work to a medical billing consultant. Call us today, and see how easy it is to get started.